WOLFEBORO — Just in time for those New Year’s resolutions for better health, Dr. Renee Tetreault opened In Good Hands Chiropractic, PLLC, on Elm Street, an endeavor brought forth with many local helping hands, in fact. After earning her Doctorate of Chiropractic at Life University in Marietta, Georgia, and spending the requisite amount of time earning credit hours and passing four national boards to become licensed, Dr. Tetreault set her sites on opening her own practice in Wolfeboro. She chose Wolfeboro as her husband, Matt Tetreault, works as a guidance counselor at Tuftonboro Elementary School and she also worked locally at other chiropractic practices – filling in for vacations and such — after earning her license. 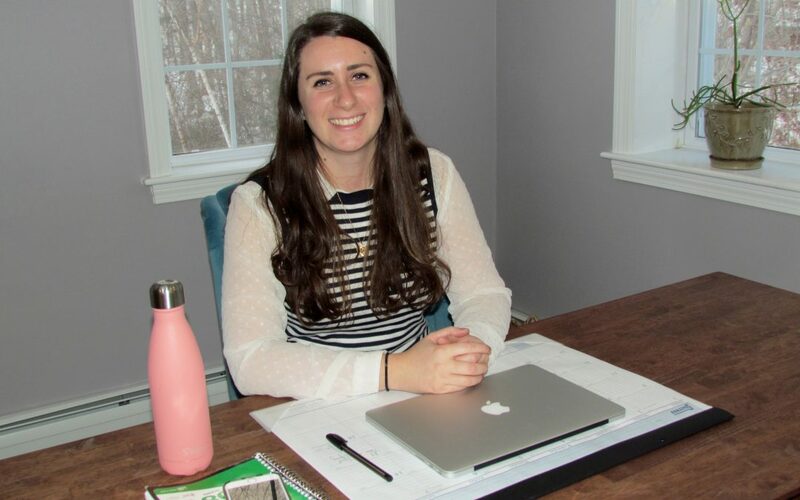 In March 2016, she “jumped in with both feet,” and when she met with a business mentor from SCORE Lakes Region, he recommended she speak with the Wolfeboro-based WEDCO [Wentworth Economic Development Corp.], a nonprofit organization whose mission is to promote and support businesses and the creation of employment opportunities by providing development assistance and financing. Dr. Tetreault reached out to WEDCO Executive Director Denise Roy-Palmer and the two met in April of 2016. Armed with a solid business plan, financial information, projections and so forth, she completed the WEDCO loan application and was approved for two separate loans totaling $50,000 to start the practice. “What’s unique about WEDCO is they work with five banks to get you the financing,” she said. “Denise was wonderful – she had quick responses to my questions, she asked questions about the business plan to clarify a few things via email. It really was a painless process to work with them,” said Dr. Tetreault. “They are very, very nice people. And what they are doing is amazing.” She also liked the fact the WEDCO loan program does not penalize for early payoff. “That was a huge priority for me, too,” she added. The purpose of WEDCO’s financing is to retain and create employment opportunities for area residents. The primary criteria are the retention and/or expansion of the regional employment base, leveraging additional financial resources, and demonstration of the borrower’s ability to repay, according to Roy-Palmer. The next big step was finding a space. The spot at 16 Elm Street had many good features including on-site parking, accessibility to downtown, and more than enough space for an office, reception area and treatment rooms. In fact, the space was originally two units but was combined into one for In Good Hands Chiropractic. She moved into the space in October 2016 and went to work with some minor updates like painting, and furnishing the office with attractive, yet bargain furnishings from eBay and Holmwoods Unfinished Furniture. Finding a practice manager was also fortuitous for this new doctor. She placed an ad on Craigslist and within weeks connected with Claudia Kay, who had run a medical practice in Vermont for 38 years before relocating to Tuftonboro. And it was the doctor’s talented brother-in-law, Josh Tetreault, who created the logo for her business cards, materials and signage. The emblem: interconnected hands in the shape of a flower. Dr. Tetreault said a chiropractor is really a doctor of the nervous system, as the nervous system controls everything in your body. In fact, she and her family members are living beneficiaries of long term care. Already building relationships with other health care practitioners, Dr. Tetreault said she wants to build a network so that she can recommend patients to other caregivers, such as massage therapists, physical therapists, acupuncturists, and so forth. New patients to her practice will fill out a patient intake form either online or at the office, complete a patient history, then speak one-on-one with Dr. Tetreault about symptoms and problem areas. This is followed by an adjustment and exam in the treatment room. Usually the patient is asked to return in 48 hours to assess their condition, and then provided with a longer-term care plan. “I lay it out and explain what’s happening – it’s an open dialogue. It’s about understanding your body as a whole,” she said. In Good Hands Chiropractic accepts many types of health insurance plans including Medicare, but can bill out of network as well. A new member of the Wolfeboro Area Chamber of Commerce, a ribbon cutting is planned for Jan. 28 at In Good Hands Chiropractic. Dr. Tetreault said she is eager to get involved, establish networks and become a part of the greater Wolfeboro community. “I really wanted to be in a community that once I was up and running, I would be involved in various ways. If my goal is to create a healthier community overall, I need to be involved in it,” she added. For this young professional, In Good Hands Chiropractic is a dream come true and she is the first to credit local resources that arose to help make it happen.